NCI in pursuance of its objective to build research cooperation between its Nordic member universities and India will support one scholar annually from a member university travelling to India for the purpose of research with the NCI Ganga Mahal Scholar in Residence Programme. Doctoral level researchers and above located at NCI member universities. NCI will provide a one-time payment of 500 Euros for the purpose of travelling to and from India. 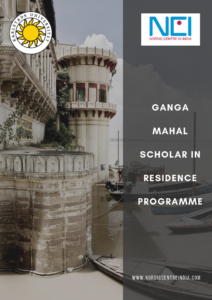 In addition NCI will cover one month’s stay at Karlstad University’s India Study Centre, Ganga Mahal, located at Assi Ghat in Varanasi. The amount will be paid on submission of an e-ticket along with a proof of travel. Ganga Mahal is located just by the bank of Ganges, at Assi ghat. Simple standard. Five rooms, comfortable as single rooms, but each room has two beds and can function as double room. Rooms have a bed, a desk, and an almira. Fans, no AC. Two toilets; one western and one Indian. One shower. Additionally, one of the rooms has a western toilet and a shower (cold water only) “on suite”. Kitchen, free to use. Fridge and cupboards with space for guests. Lunch is served Monday to Saturday (included in accommodation fee). Large living room, where lunch is served. It is also suitable for work, studies, and small gatherings. Balcony, and a big rooftop, from where one can enjoy the view over the Ganges. Free WiFi available in the living room. One washing machine, free to use. Place manager, Rajeev Sharma, helps with all practical matters, from arranging visits and tours to help with fieldwork. He can also help with translations, if doing interviews for fieldwork or the like. No alcohol allowed; no smoking permitted. Address: B2/1 Ganga Mahal, Bhadaini, Varanasi, Uttar Pradesh 221005. The following should be sent to Lise Hansen (nci@au.dk) by email with a subject line – Ganga Mahal Scholar in Residence Programme. Applications will be evaluated by a Grants Committee based on the purpose of the visit and its expected results. One of the criteria to be used in evaluating the applications will be research potential for long-term Indo-Nordic cooperation and benefits for the Nordic Centre in India. Upon completion of the visit, the visiting researchers will be required to submit a short written report to the Nordic Centre of India describing the content and results of their visit. You can download the poster for the opportunity here.